A popular concept in the rich countries of the world is that those countries should "share" their wealth with the poor countries of the world. Endless hand-wringing over the distribution and consumption of Earth's natural resources and the concentration of the planet's wealth are practically a pastime. There is nothing wrong with providing aid to people living in poor countries -- in fact, the ethical grounds for doing so are quite solid. Since no one can influence where he or she is born, and since most people don't emigrate from their home countries, most of the world ends up living in poverty or wealth by chance of birth. But believing that aid means "sharing" and not "cooperating" is foolhardy at best -- and patronizing at worst. The groundwork for a nation's wealth or poverty is typically laid at least a generation or two before it takes root. America was founded by people pursuing "life, liberty, and the pursuit of happiness," but the United States only became a truly wealthy nation in the late 1800s and early 1900s -- having persisted through decades of economic mediocrity. Once the fundamentals had been put in place, however, America's long-run chances at wealth were essentially ensured. With the rule of law firmly in place, private-property rights ensured, trade with other nations a common goal, and prudence at the core of the nation's monetary policy, Americans could move from second-rate to economic preeminence. When we think about aid to poor countries, direct assistance -- the immediate relief of starvation, illness, and suffering -- is important. In this regard, the rich do have a moral obligation to share with the poor. If nothing else, they should realize that their health and affluence is, to a large degree, a case of "there but for the grace of God go I." But direct assistance is only half of the solution. The immediate relief of suffering is inadequate if nothing is done to assist those poor to enact the fundamental changes they need in order to emerge from poverty. This is no small matter -- it's possible to extract some estimates about how many years different nations are ahead or behind one another in their stages of economic growth. Per-capita income in Iran in 2003, for instance, was roughly the same as it was in the United States in 1930. That indicates about a 70-year (or 2- to 3-generation) gap in income. Life expectancy in Bangladesh around the year 2000 was roughly the same as that in the US in 1940. Direct aid alone isn't enough to eclipse these differences between wealth and poverty. Aid must be a combination of relieving immediate suffering and helping to lay the foundation for the eventual eradication of the poverty that causes that suffering. It is on these grounds that few people really agree about aid. Most of the people who talk about foreign aid think mainly about the "sharing" question. Opponents of "sharing" usually land in one of two camps: Either they object to sharing in its own right, or they rightly realize that sharing doesn't really solve the problem of poverty like trade and economic growth can. 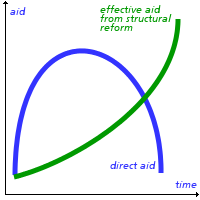 Foreign aid really has to be a combination of the two. 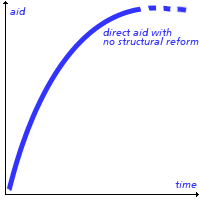 Structural reforms are the only long-term solution to poverty. Free trade and the rule of law release the natural industriousness and capability inside most people -- no matter what their language or religion. People are fundamentally creative and innovative, and given either greed or simply a sense of obligation to their families, they are willing to work hard when given the opportunity. An outstanding example is Cuba's perpetual dependency; first, upon the Soviet Union, and now upon Venezuela, among other nations. Cuba will remain poor despite vast quantities of direct aid because it lacks the fundamentals of a market economy that could pull it out of poverty. Dependency begets further dependency. The rich and poor countries of the world are not parent and child, nor master and servant. They are siblings. Siblings don't boss one another around, nor do they take advantage of one another. They see one another as partners, and they realize that they both have growing up to do.